It was a pure delight photographing Laura & Jon's wedding...whimsical, fun yet oh so chic & glam all combined into one! Laura started her day getting ready at the very chic Opus Hotel in Yaletown. She wore the most stunning bejeweled dress by designer Jenny Packham. I was thrilled to see how vintage-inspired her whole look was! Very hollywood glam thanks to Sara & Jasmine from Best Face Forward and of course, topped with a beautiful birdcage veil & gorgeous jewellery by the talented Elsa Corsi of Jewelliete Jewellery. To keep things a little 'English' (Jon's parents were from England), many of the female guests adorned beautiful fascinator headpieces. Here's Jon's mother below with one beautiful feather headpiece. Just loved the pink & grey! Jon may look familiar to some of you if you watch the news, he's an investigative reporter with CTV News. Before heading over to the ceremony, Jon & his groomsmen cruised around the beautiful Vancouver waters on a bayliner boat before heading over to Vanier Park for photos. The ceremony was held at the Museum of Vancouver, outside the Planetarium. A quaint lemonade stand was made available for guests to keep them well hydrated on a warm day. Guests even had time for a fun game of croquet before the ceremony. Guests were then transported to the rooftop of the Vancouver Art Gallery for the reception. We loved photographing all the beautiful wild flowers and bird cages that adorned the centre pieces throughout the room. 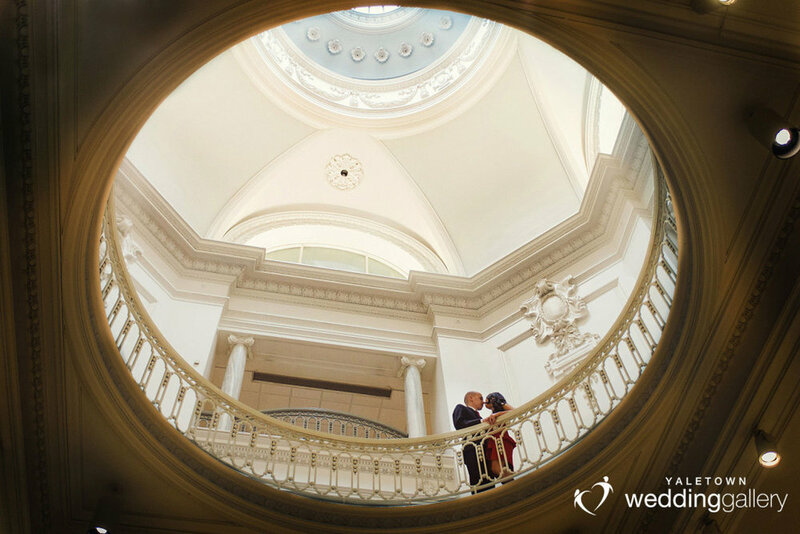 The VAG is a gorgeous building so we had to sneak away with our two love birds to get some photos around the gallery. We LOVED every bit of this wedding. Laura & Jon are such wonderful people it really made it so magical for us to photograph their incredible wedding. Congratulations Laura & Jon!